As buzz about sustainability rises, bloggers are discussing issues beyond global warming and revealing new insight into consumer behavior. More than ever, consumers are paying attention to corporate social responsibility as "going green" becomes a key factor in buying decisions. 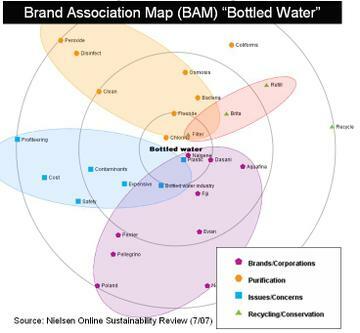 How do consumers perceive corporate actions and brand messaging related to the sustainability movement? One issue Jessica will touch upon is what Mya Frazier of Advertising Age recently popularized in a cover story as "Greenwashing" -- which Wikipedia describes as "the act of misleading consumers regarding the environmental practices of a company or the environmental benefits of a product or service." Jessica and her team have been carefully studying whether consumers actually view corporate claims around green as credible and believable. Again, this is a classic area where listening really matters. Brands need to understand where consumers are both open to messaging, and the level of belief, disbelief, or skepticism they are starting with before they hear corporate claims. In many cases, claiming "green" just won't fly, especially as consumers exercise the web's "transparency toolkit" in the form of search, Wikipedia, activist web utilities (which make it increasingly simpler to vet out claims). This is yet another reason why I peg "affirmation" and "transparency" as two of the my six drivers of brand credibility in my upcoming book. Truths or untruths are readily affirmed on the web. Here's the link to sign-up. 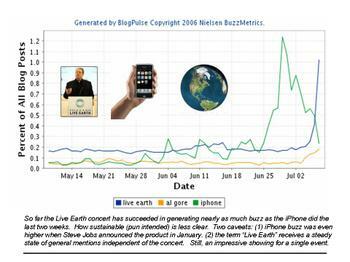 The buzz jury is still out, but there's just no question the Live Earth global concert is giving iPhone buzz a run for the money. Whether it's sustainable (pun intended) or not will take time to determine, but the concert does appear to have succeeded in generating a significant, and growing, global conversation on the global warming issue. This chart below merely reflects global CGM on blogs. There's plenty of additional activity on You Tube, message boards, MySpace, MSN Community, and beyond. While obviously catalyzed by music, the event conversation appears to be replaying the key desired themes, issues, debate-topics, and what I might dub "pledge talk" organizers, including Al Gore, had hoped for. One interesting things I'm seeing is lots of folks posting to their blog or MySpace page relatively short blurbs in order to "memorialize" or "time stamp" their participation at what they deem to be an historic event. I even caught a few posts that appeared to be sent directly from mobile phone text messaging. Hey, whatever it take to be part of the permanent record.